There are no more cops in riot gear in Baltimore, but the severe shift in their presence —from armored cops policing peaceful protests to their laidback distance during the high homicide count this month— can’t help but feel like a silent counter-threat to some citizens of West Baltimore. The end of May marks the city’s deadliest month in over 15 years, with more than two dozen people shot over Memorial Day weekend, many in the neighborhood where Freddie Gray was killed by police force and where protests in his memory ended in riots and a mayor-requested state of emergency. If it’s surprising, it shouldn’t be. The last time I was in Baltimore, during the week of the Freddie Gray protests and the State’s Attorney’s decision to charge the six officers involved in his arrest and subsequent death, the sense of community between locals was strong, supportive, and vibrant. The suspicion and distrust of Mayor Stephanie Rawlings-Blake was at an all-time high: In the span of a few days, she described teenagers who were corralled by police in riot-gear as they left their school as “thugs,” suggested citizens act as community peacekeepers between riot-gear cops and violent citizens, showed distrust of peaceful protesting by instituting a city-wide curfew, and even butted heads with the officers from the Baltimore City Police Department. Some of the same confusion that plagued the community then persists today, because Freddie Gray’s death hasn’t explicitly brought about local political transparency or policing policy change. Not yet, at least—and probably not for a long time, if ever. What is clear is that last month’s protests embroiled Baltimore’s local government in a nationally televised ideological PR scandal, as Gray’s death rightly added to the rally-cry for a national movement against police brutality. Even as government-friendly outlets like CNN and FOX have told the story in ways sympathetic to local government, though, residents know that the problems were deeply systemic. There are Bad Cops and Good Cops, but the latter often silenced by the former; community police are pitted against the public by informal arrest quotas; the mayor’s word is only as good as the camera following her; and the sorts of policy changes that allow the political class to position itself as responsive to the citizenry are often the kind that prevent police from protecting and serving effectively. We’re now a few weeks removed from the state of emergency, and with all six officers involved in Gray’s death indicted by a grand jury on various charges. (Two —Edward Nero and Garrett Miller— were indicted on second-degree assault, reckless endangerment, and misconduct in office for “failure to perform a duty regarding the safety of a prisoner,” and illegal arrest.) This news was shared with the public and officers alike on May 21, the day before the long holiday. By the end of the month, the city would suffer the highest number of violence-related deaths (35) in the city since May 1999. After the overwhelming national coverage of the Freddie Gray protests, the police, the mayor’s office, and the Fraternal Order of Police have been called to task and, as a result, are constantly on press-conference parade. Department meetings with the FOP and internal memos are frequently made public, both in response to criticism about the opacity of internal decisions and as a result of increased violence through the city. A memo from Police Commissioner Batts noted that the spikes in violence were highest in “neighborhoods historically impacted by violent crime” (i.e. the Western District, which includes Gray’s Gilmor Homes), and sent veteran officers from the neighborhood out to rebuild trust and community relationships. 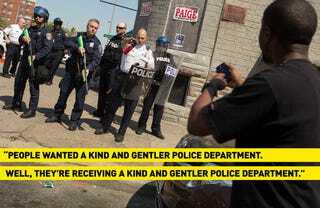 Meanwhile, members of the alleged “kind and gentler” department bristled with anger at the orders as violence continued to spread around them. One officer I spoke with blames the mayor’s office for the lack of an organization and support for the department, citing resentment over how officers were told to play nice while watching City Hall support charges against their peers. The cops aren’t wrong in feeling unsupported by those at City Hall. According to one BPD street cop, the city has continued to handle basic internal affairs disastrously. He says that low-ranking cops, many of whom are activated on holiday-weekends, are still being shorted on regular-hours pay. He goes on to say that communications within the department are severely lacking and that basic procedural issues are addressed only for show, specifically referencing protective gear issued to cops.